Long before he was the taco seller whose 'Gringo Dog' recipe made him famous throughout Mexico City, our hero was an aspiring artist: an artist, that is, till his would-be girlfriend was stolen by Diego Rivera, and his dreams snuffed out by his hypochondriac mother. Now our hero is resident in a retirement home, where fending off boredom is far more gruelling than making tacos. Plagued by the literary salon that bumps about his building's lobby and haunted by the self-pitying ghost of a neglected artist, Villalobos' old man can't help but misbehave: he antagonises his neighbours, tortures American missionaries with passages from Adorno, and flirts with the revolutionary greengrocer. 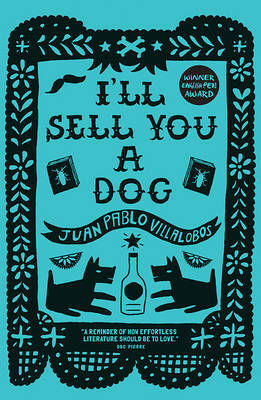 A delicious take-down of pretensions to cultural posterity, I'll Sell You a Dog is a comic novel whose absurd inventions, scurrilous antics and oddball characters are vintage Villalobos. Juan Pablo Villalobos was born in Guadalajara, Mexico, in 1973. He's the author of Down the Rabbit Hole (2011) and Quesadillas (2013), both published by And Other Stories. His novels have been translated into fifteen languages. He writes for several publications including Letras Libres, Gatopardo, Granta and the English Pen blog, and translates Brazilian literature into Spanish. He lived in Barcelona for several years, then moved to Brazil, and is now back in Spain. He is married with two Mexican-Brazilian-Italian-Catalan children. ---------- Rosalind Harvey was born in Bristol in 1982. Her translation of Juan Pablo Villalobos's novel Down the Rabbit Hole was shortlisted for the Guardian First Book Award and the Oxford-Weidenfeld Prize. She runs regular translation-related public events in the UK and is a founding member and chair of the Emerging Translators Network, an advice and support network for early-career literary translators.